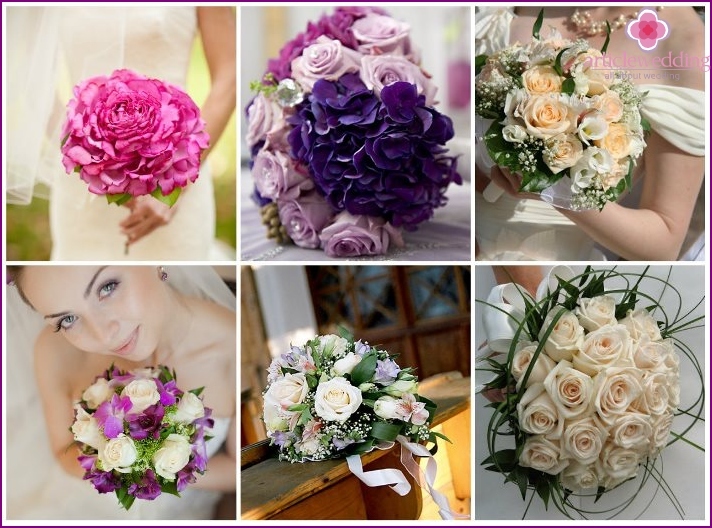 Wedding bouquet - an important attribute for the bride. 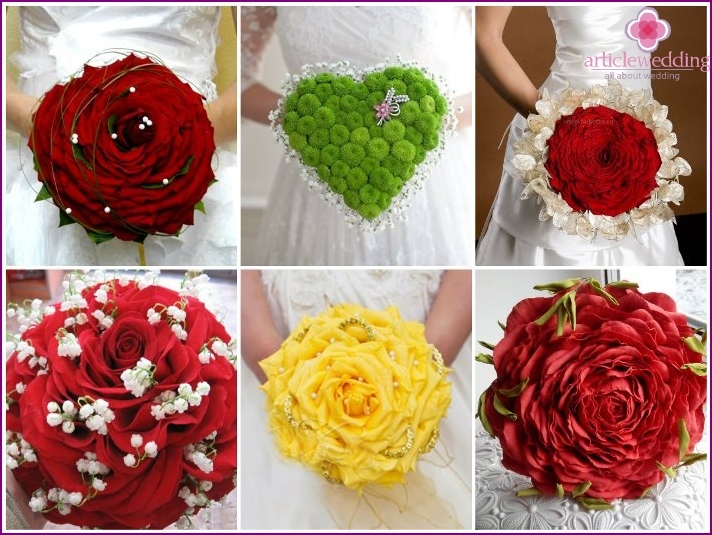 Every girl to marry, puts a special meaning in flowers donated by the groom. This attribute makes any bride add a touch of romance, vitality. 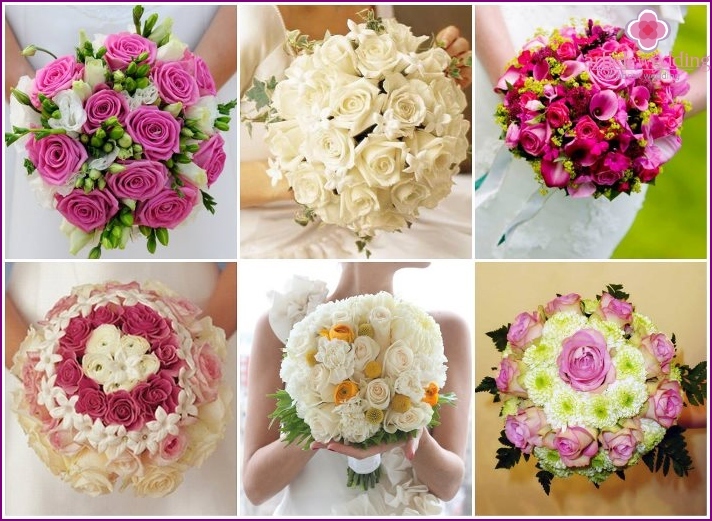 In order not to lose with a choice, you need to know what kind of wedding bouquets are. 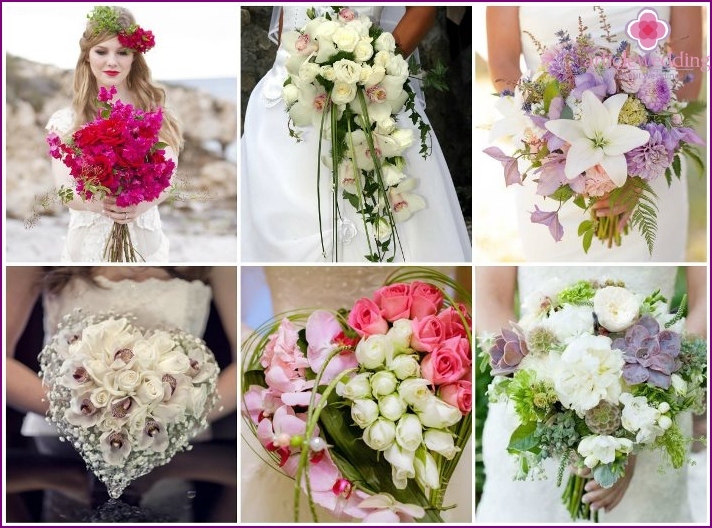 Festive floral arrangement gives the image of the bride romance, highlights the beauty and uniqueness of her outfits. 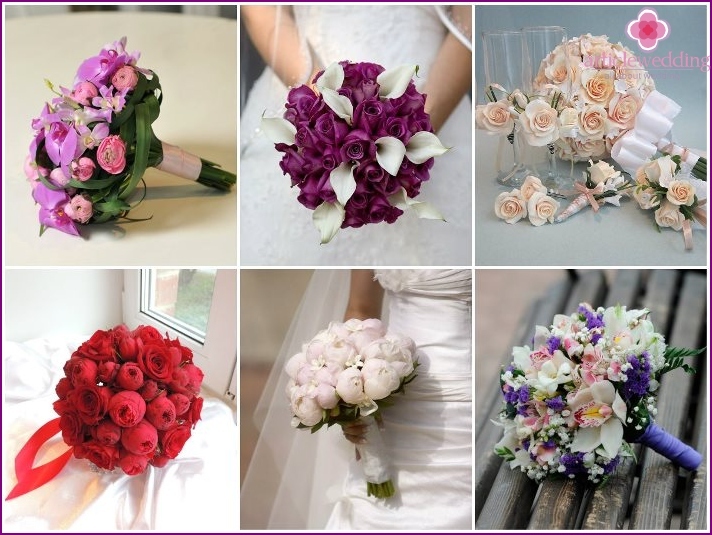 The size, type of wedding flower arrangementchoose based on their shapes. For girls, have above-average growth, will approach bouquet elongated. The lean bride will look better with round or guttate floral accessory. For a woman "in the body" would be a good option all in a lush, or made in the form of an arc. Consider the shade of hair. Blonde white color is not suitable, then give preference to pink tones, mauve and lilac. bright white color, shades of red, purple is an excellent choice, even yellow tone suitable for dark hair. To suit haired coral shade. 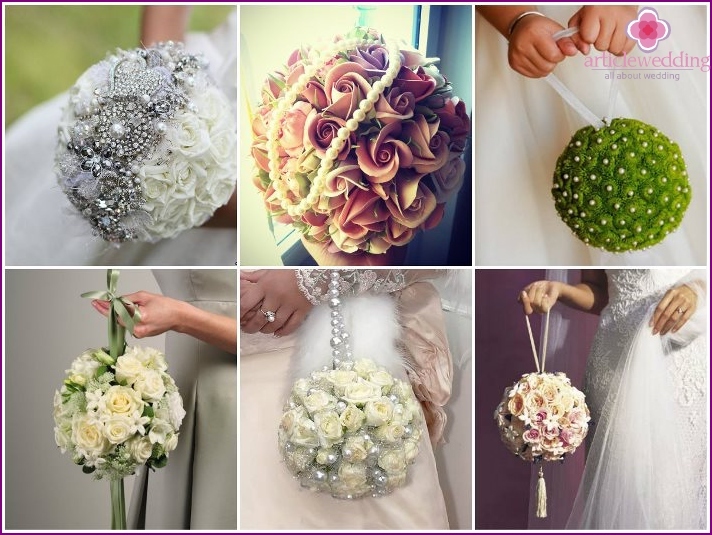 Florists say 3 kinds of bridal bouquets: in the form of a ball, drops and extravagant. Based on the traditional forms of the composition are made of various kinds and styles. Choosing gifts for celebration flora easily confused: Modern florists offer a large number of flower arrangements. A professional will be a work of art. The most popular flower accessory - in the form of a ball. It is suitable for low women. The composition in the form of walking sticks, umbrellas, clutch bags adorn the bride in a nontraditional wedding dress, such as a trouser suit. Wedding flowers collected in the form of drops, visually accentuate the harmony of the bride. Bouquet with flowing leaves and stems will add very fluffy dress. 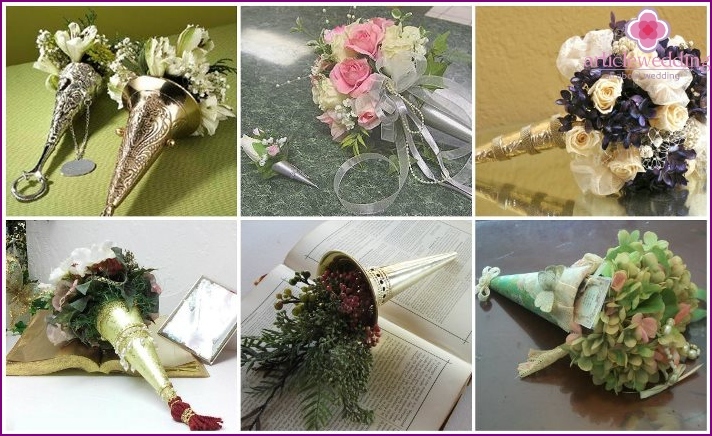 If the flowers are for slim tall girl, they should be collected in a vertically-teardrop shape (it is universal, suitable for almost any type of brides). Round Flower compositions created from layersdifferent colors are known as Biedermeier. The central flower is twisted in a circle on a variety of flowers and plants structure. There are not only flowers, but also herbs: feather, fern leaves, spikelets. Are wrapped such a composition a variety of materials (plastic, lace napkins, felt). The wedding florist in demandcomposition, like a large flower. In fact, it is the ensemble assembled from petals of different colors. The buds of lilies, gladioluses, peonies, roses are spreading to large parts of which the composition is going. 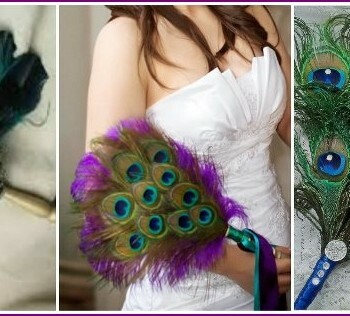 Grips petals with hot glue, a pen decorated with the style of the bride's fabric or belt. Flowers in the shape of a circle made byspiral technique. A stem so as to have a spiral shape, then they were ligated tape. Round flower bunch suit handsome, tall girl in classical dress simply. For such a composition, use different types of roses, carnations, peonies, lilies. Buds are decorated with beads, sequins. 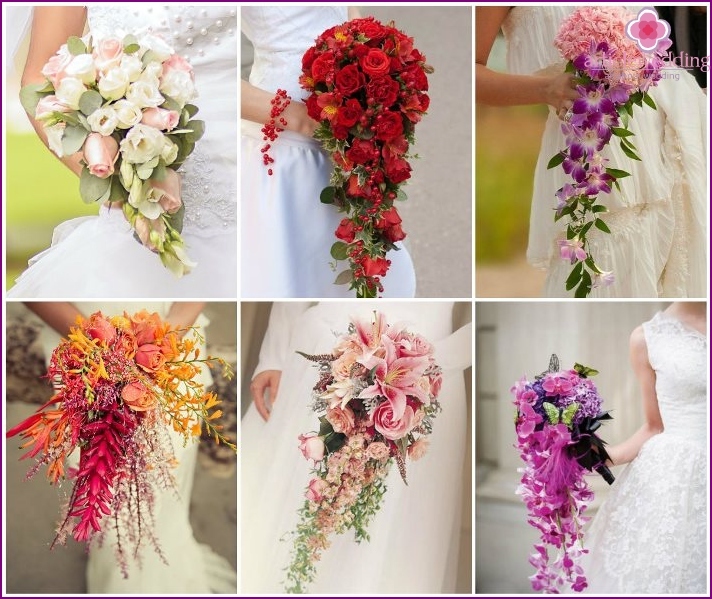 If the evening tired bride hold flowers, they are easy to hang on the wrist using the belt loop attached to them. This type of decorative cords composed ofdifferent plant species, at first glance to be combined with each other. Flowers are placed on different heights. Due to its multi-stage, color saturation, the bouquet is an extravagant character. 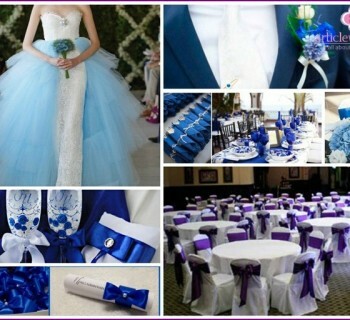 This kind of wedding accessories will suit the couple planning to extraordinary triumph. Wedding bouquet in the form of a hemisphere looks likemystery that the top looks like a round, and the side has the shape of a half sphere. It is made from the buds of roses, lilies, carnations, which have close to each other. In addition to this technique, use all kinds of materials: herbs, fabric, feathers, ribbons. 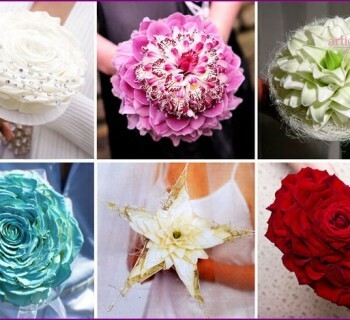 Flower bunch should be light, comfortable to wear for a long time. All stems wedding arrangement decorated to the leg does not cut hand. 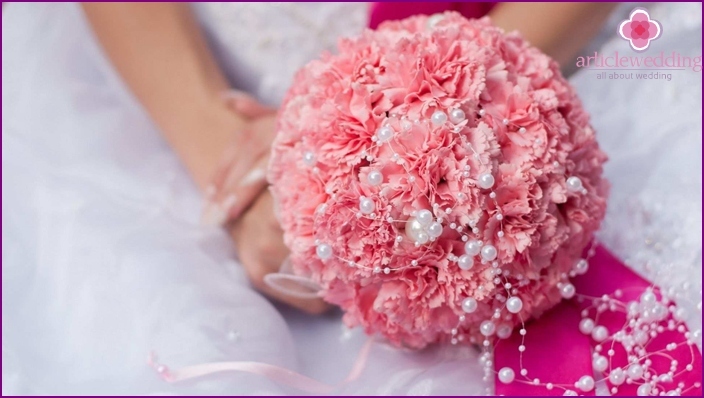 The most popular wedding flower accessory -in the form of a ball. For its production florists use portbuketnitse, inside which is placed a sponge, to be fed with moisture and minerals. For a long time he stays fresh. In portbuketnitse inserted tiny flower buds on short legs to get the form without beginning or end, in the form of a ball. Handle decorated with a ribbon at the tone of the bride dresses. Wedding floral ensemble in a drop-downleaves waterfall is called the cascade. Acquire his romantic nature. His form of an accessory underlines the elegance, the harmony of a young girl. Through a combination of different colors and shapes, he emphasizes the benefit any part of the bride's dress. For cascade composition using additional materials: green fern, ivy stems. The most refined and original weddingaccessory - certainly, Toussaint mousse. This French mini composition is formed by a cone-shaped vase made by hand, which is decorated with sequins and beads. For this ensemble fit roses, daisies, gerbera. Tussy mousse impresses by its brightness and cheerfulness. This product is perfect for the bride fitting dress.